Bring the brown sugar and honey or corn syrup to a boil, as soon as it boils remove it from heat. Add the vanilla and peanut butter and stir it. Toss your oats, rice cereal, and nuts or fruits in a bowl. Press the mixture firmly into either an 11x7 or 8x8 inch greased pan and cut them when they're cooled. I use an 8x8, and so I cut them with a pizza roller about an inch wide, and then twice more across, making them about 1 x 2 1/2 inches. They're dense and thick, so this size works for us. Either wrap them individually, or put them in a sealed container to keep them chewy. Thank you for sharing this recipe. I am going to make these today. i am heading to the kitchen right now...no joke..right now!! lol. I will come back and post what I thought!! Thanks!! those look delicious. now if i could only get the motivation to do something about it. I came back to say I made these today too. I used white chocolate chips because that is what we had, and added the optional coconut. They tasted soooo good. Thank you so much for sharing. Sara - you're welcome!, and I'm glad you like them... yours sound delicious! I was just saying today that next time with coconut. Hi, Liberty, and thanks for leaving a comment! Shelane - they're as good as Quaker's, I think, and they're so quick and easy. Sarah - I bet you could. 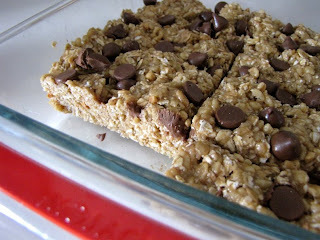 My friend Julie uses brown rice syrup for a substitute for things... try it!